Gallery IS, is pleased to present the work of Artist Arlene Westen Evans. Arlene Westen Evans combines personal narrative with a unique visual lexicon to depict her life journey in this series of fifty artworks. An indefatigable artist and instructor with over 25 years experience in the arts, Westen Evans graduated BFA Honours (Distinction) from the Alberta College of Art and Design in Calgary. She has conducted numerous workshops throughout western Canada including Summer Series at Red Deer College in Alberta. Please join us on First Friday, September 4th from 6-9pm, to celebrate the opening of this unique collection of work. The artist will be in attendance and also the Gallery IS open studio artists will be at work in their spaces. Gallery IS, is pleased to present the work of Alison Philpotts. perceives. This is my joy. 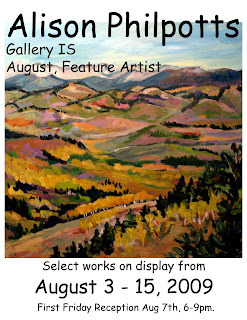 Alison's work is on display from August 3rd to August 15th. All works are for sale. Opening Reception and Gallery IS Open Studios are First Friday August 7th, 6-9pm.